These guys set the record for world's longest domino wall at 30 meters. 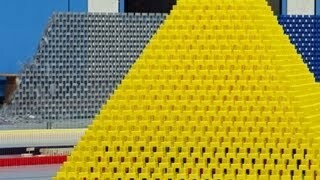 Uploaded 2 years ago http://www.sinnersdominoentertainment.com The longest domino wall was 30 m (98 ft 5 in) long and consisted of 31,405 dominoes. Longest domino wall – Guinness World Record. Domino wall constructed 8 member team. Amazing video clip.